Earn $2.47 in Rewards credit (247 points) What's This? Have you been disappointed in your bike's recent shifting behavior? Missed shifts, strange noises, or slow response time all could mean it's time for some new cables. The Shimano OptiSlik Shift Cable Set has everything you need to deck your bike out in new, friction-free shifting. 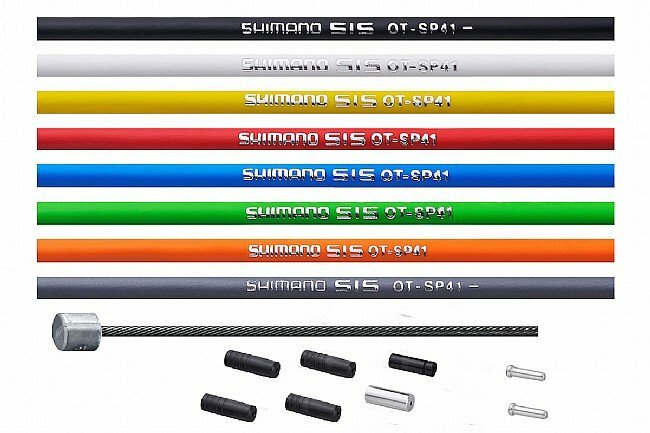 Each stainless steel shift cable features Shimano's OptiSlik polymer coating, reducing the surface area and providing a smooth, lubricating surface between the cable and the shift housing. These cables reduce shift effort by up to 20% over Shimano's previous game-changing PTFE shift cables. With less friction, your bike will be shifting with more precision and faster response, and a longer lifespan. Compatible with Shimano road and mountain bike shifters. Includes two shift cables (1.2 mm head x 2100 mm or 1800mm length) and1700mm of cable housing, sealed inner and outer cable caps. Available in multiple colors. I just love some of the changes we are seeing in the bike industry and many other industries. Namely online shopping. This genuine product got to me in the perfect condition and at a timely manner. But thats not the best part.. the best part is that price and selection on these bike parts are not beatable by the local bike shops. I used to worry about the time it takes for shipping and whether im getting genuine products or fake ones, well, all those worries are a thing of the past because the companies themselves are producing these products with internal security features against fraud and now they are coming to us at a low cost which makes it pointless to produce fakes.. I don't know if these are better than the older style DuraAce cables, but they are lickety slick compared to the old corroded ones I replaced. I got black, but nice that there are so many colors. Worked bettter than higher priced cables. These replaced Shimano polymer coated cables which failed during installation. The Optislick shift cables have been functioning very well for me. Excellent brand slick coated cables.Positive feel,last longer.Great performance minded cables.Slick..
Like these cables for that dream bike and want optimum shifting feel.Lasts couple years or more.Great performance packet of shift cables.No moisture can rust em,weakin the function.Housing is top drawer.